Our living room is a place to entertain, laze, gather as a family, sometimes eat, work (hubs works from home at a desk in this room) and where I'm happiest blogging from my laptop on the sofa. It's my room first thing in the morning when the rest of the household slumbers but during office hours I retreat to other parts of the house. Come the evening and weekends it's such a treat to kick back and relax again in this room. Hubs has a desk in the corner where there are two windows but the opposite corner (with a third window) has been a little bare since we moved in nearly two years ago. This is where we put the tree at Christmas but we have often talked of making more of this space. Inspired by Atlantic Shopping's Best of British campaign I decided to join in and create my own British themed corner for this room. A tub chair seemed the perfect solution for this small area and I chose a red chair from Atlantic Shopping for its neat shape and cheery colour. I then set to styling the corner around this little tub chair and Atlantic Shopping's Best of British theme. Oh what fun! Out came a sweet Union Jack cushion cover made by our youngest at school last year (not perfectly made but that's why I love it), a favourite throw and a neat side table from Habitat (no longer available but can be found on Ebay). To make the space more personal we created two prints based on our favourite holiday destinations in the Far West of Cornwall, Penzance and St. Ives. They hang on the side facing wall by the chair and make the corner more intimate. I quite like the fact that they can't be seen from all angles of the room. Apart from the Ikea frames and chair this little corner has cost very little to put together. The front of our house is south facing and when the sun shines the living room gets really warm. Even without the sun this corner is the perfect spot to gaze out of the window and now on this new comfy chair I can read, enjoy a nice cup of tea and dream of sunnier days! I'm really pleased with our new cosy corner complete with comfy chair. Below is a guide to where the items came from in case you're interested. I hope you like it as much as I do. I love your room and especially like the way youve itemised each item and where its from! nice view out of the window too! So tranquil. I like the Union Jack pillows, but I don't think I would want a stars and stripes pillow (I'm American). I must not be patriotic enough, but yours are lovely and whimsical! I think I have the same cup and saucer as you - Ikea? I love your prints of Penzance and St Ives. Your corner looks cosy and inviting. I am often staring our of the wondow from my corner of the conservatory with a cup of tea in hand. Oh wonderful, what a lovely corner to sit in. I love the Cornish prints as well, beautiful. Claire you have indeed created a cosy corner and seeing you enjoying it was a delight. What perfect corner to retreat to. We all need a calm space to chill in I find. This is so lovely! We recently created a similar corner in our home and find we use it constantly. A chair by a window is a treat - good light for reading or crafting, or nice just to sit with a cup of tea and gaze outside. I really love the homemade cushion and think any imperfections just add to the charm. Thanks Gillian. Yes, I saw and admired your lovely corner. Our prints were made using Adobe Illustrator, various picture references which influenced a limited colour palette and we used high quality print. A combination of hubs' technical expertise and joint creativity! 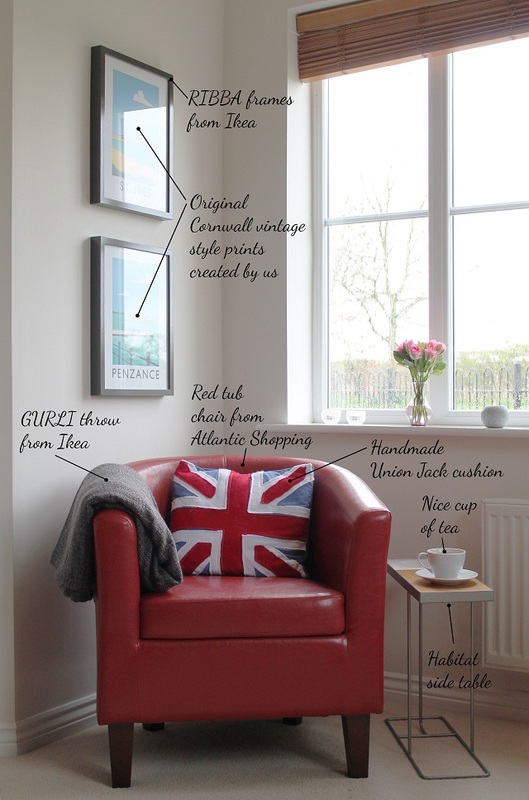 Hi,Love your blog.LOVE that chair.had to smile at the pictures,I live in St.Agnes Cornwall,so glad you love our part of the world I wouldn't live anywhere else.Great cushion too. I love everything about this! Especially those prints and the little side table. A little disappointed to find you created those prints yourself, I would love to pick up one for myself! Well done! I had to ask for a break leg' in order to pick the best deal by contacting multiple double glazing suppliers. It was really consuming. Now agent's help and guidance is there to help everyone.